This is another “Happy Autumn” card made. I made if from the leafy die frame that came with the Hero Arts September My Monthly Hero (MMH) card kit. There are lots of beautiful stamp images with this kit. However, I chose to use the leafy die frame that came in the kit and run with it. The frame was colored with Hero Arts inks and a sponge dauber. I also used the “Happy Autumn” sentiment that came in the MMH stamp set. I first matted the finished leaf frame against a cream-colored cardstock, but it looked bland. More texture was needed, so I used a background cover die to add a woodgrain texture. Die cut the leafy frame from a piece of Bristol Smooth paper. I did this because I intended to do a lot of ink blending and Bristol Smooth really helps achieve a very blended ink look. Dab inks in autumn colors around the leaf frame using sponge daubers. Blend the inks as you go around the frame until you get the desired effect. Set the frame aside. Die-cut an A2 (4.25” x 5.5”) piece of cream-colored cardstock using a wood-grain patterned cover die. Trim the A2 cream-colored mat down to 4.00” x 5.25” (trim an eighth of an inch off on all sides). Die-cut a sentiment banner from the same cream-colored card stock. It should be slightly longer than the width of the sentiment. Heat emboss the sentiment using Versamark ink and rose gold embossing powder. Punch out tiny leaves and acorn using a leaf border edge punch from copper and bronze metallic papers. Adhere the leafy frame to the cream-colored, woodgrain mat with liquid adhesive. Adhere foam tape to the back of the sentiment banner and place it on the matted frame piece. Adhere the tiny leaves and acorn to the card front as show in the photo. Mount the card front (matted frame piece) to an A2, horizontal-oriented, top-folding card base cut from rust-colored cardstock. 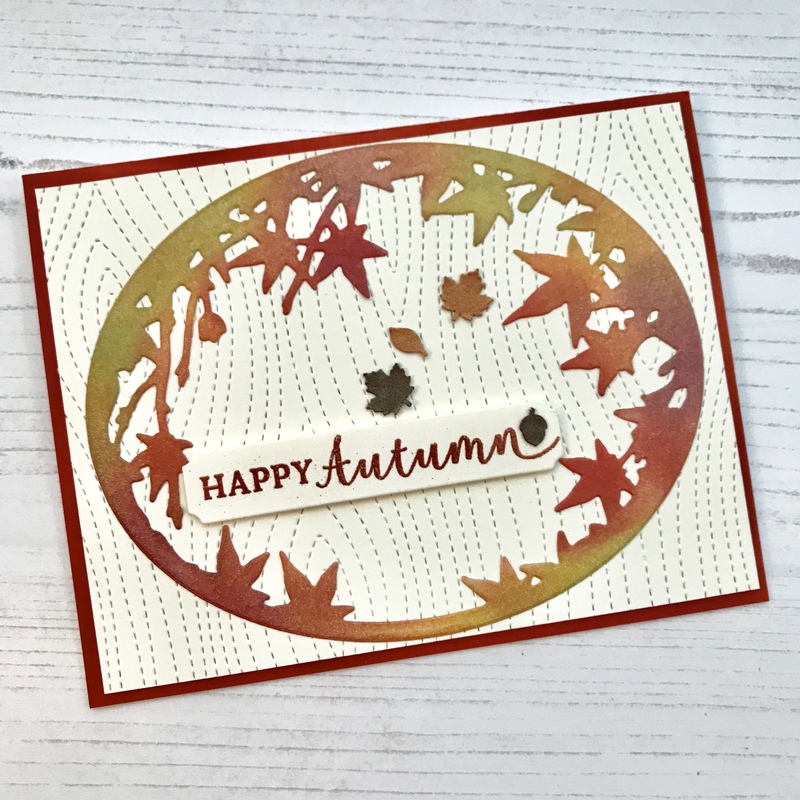 Stamps: My Monthly Hero Card Kit of September 2018 – stamp set (‘Happy Autumn’ sentiment for this kit). Hero Arts MMH September 2018 card kit: leafy border/frame. Lawn Fawn: Woodgrain Backdrop die. MFT Die-namics Sentiment Strips die – This particular die set may no longer be available. Inks: All inks are by Hero Arts: Mulled Wine, Moss, Butter Bar, Just Rust, Royal Red. Strathmore Bristol Smooth paper (100#) – for the leaf frame. Neenah Classic Crest cardstock in Natural White (this cardstock is a very subtle cream color) 80# (for sentiment strip and woodgrain mat). Papertrey Ink: Terracotta Tile 100# cardstock for card base. Metallic paper in bronze and copper (from my stash). Other: Rose Gold embossing powder from Simon Says Stamp. Autumn arrives tomorrow technically and where I live, the cooler Fall weather has arrived today! YAY! Spring and Autumn are my favorite season, followed by Winter. This is mainly because I’m a creature that despises heat and humidity and I live in a place in the Midwest where we have plenty of that in the summer. Spring is wonderful because things become alive and start blooming. Fall is wonderful because of what I’ve mentioned previously. Winter is great because I love wearing sweaters and it’s too cold outside to do anything but craft and make cards! I love rich color and Autumn is the time of year where Nature’s rich textures and golden sunlight come into play. I hope this card captures some of the rich colors. The card was easy to make as far as techniques go, just randomly stamped leaves using rich autumnal colors. Hope you like this project. Have a great Fall day! 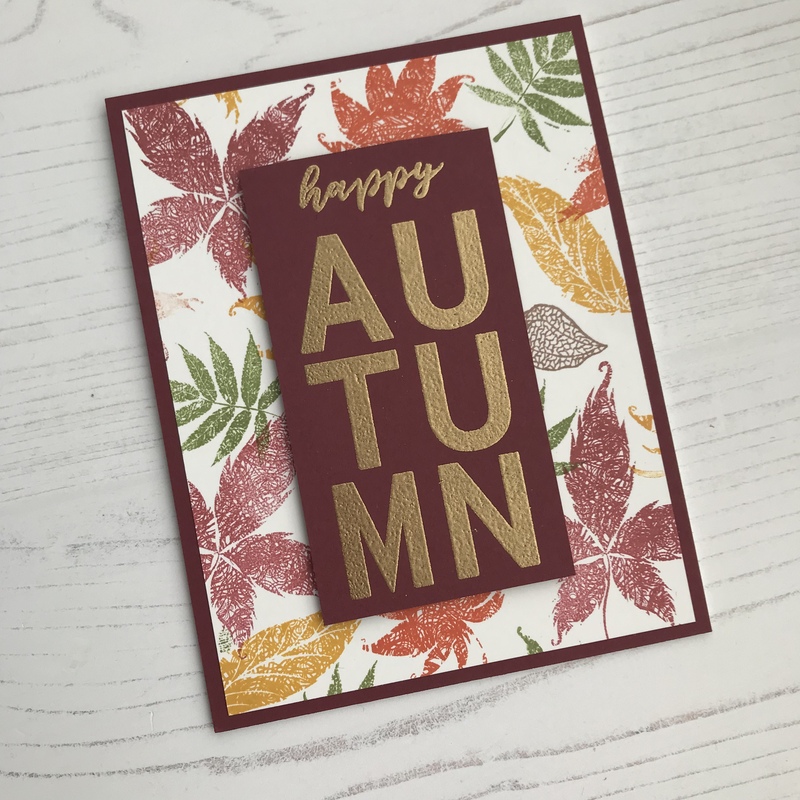 Stamp a pattern onto a piece of white cardstock cut to 4” by 5.25” using various leaf stamps in autumnal colors. Stamp the sentiment using Versamark ink onto a burgundy piece of cardstock. Heat-emboss the sentiment using gold embossing powder. Adhere the sentiment piece to the leaf-patterned card front with foam tape. Adhere the card front to a burgundy A2 landscape-oriented card base. Hero Arts Bold Inks in Mulled Wine, Moss. Hero Arts Shadow Inks Mid-tone: Pumpkin, Cup o’ Joe. Catherine Pooler Inks: Mandarin Spice. Neenah Solar White 80# cardstock (for leaf background). Papertrey Ink: Scarlet Jewel cardstock (for sentiment and card base). Wow Metallic Embossing Powder in Gold Rich Pale. 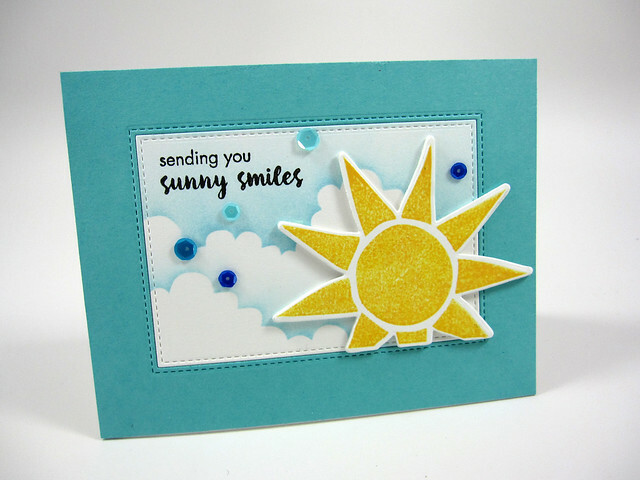 Simon Says Stamp’s Flickr Challenge #72 is all about summer and what it means to you! A bright sun and the clear blue water of a lake would make anyone smile during the summer. This is the second of two submission to SSS’s Flickr challenge. If you want to see my first interpretation of this challenge please go to my post Hello Summer. 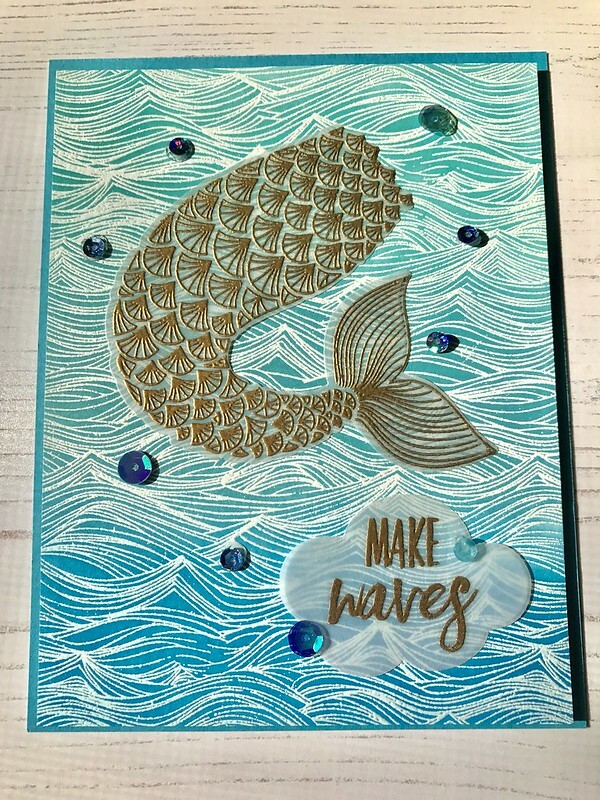 The wave background was stamped onto A2-sized white cardstock with Versamark ink and then heat embossed using white embossing powder, after prepping the cardstock with an embossing bag. Then the embossed wave background was colored using three different colors of blue Distress inks to create an ombre effect. 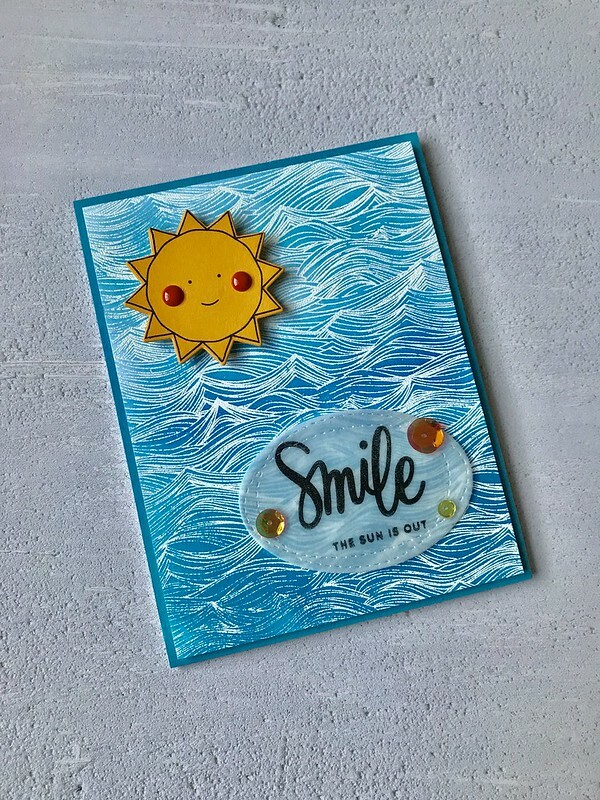 The sun was stamped onto yellow-orange cardstock and then die-cut using a coordinating die and orange enamel dots were added to the sun’s cheeks. The sun was mounted onto the card front with foam tape. An oval die was used to cut an oval from vellum cardstock for the sentiment. Then sentiment was stamped in a black ink compatible with vellum. Sequins were then adhered around the sentiment using glue dots. Glue dots were adhered to the back of the sentiment behind the sequins and the entire piece adhered to the card front. The card front was cut down to 4” x 5.25” and mounted onto an A2-sized piece of cardstock. The entire piece was then mounted onto an A2 top-folding, portrait-oriented card base. Distress Inks in Tumbled Glass, Salty Ocean, and Mermaid Lagoon. Whenever I think of summer, I think of the sun and puffy white clouds against a bright blue sky. This card is a representation of all of that. This is one of two of my submissions for this challenge. For the other submission, please go to my post: Smile: The Sun is Out. Using watercolor cardstock, I used Distress Oxide inks to create a yellow/orange back ground using plenty of water. I did this by smooshing (a very technical term) Fossilized Amber and Spiced Marmalade oxide inkpads onto a craft mat and spritzed water on the craft sheet until the colors beaded up. I then swiped the cardstock face down onto the colors, moving the cardstock until the cardstock was full covered with ink. I dried the cardstock with a heat gun and then swiped it onto the inked craft mat again, and dried the cardstock again. I repeated this process until I got the desired result. I added more ink or water as needed after each swipe. 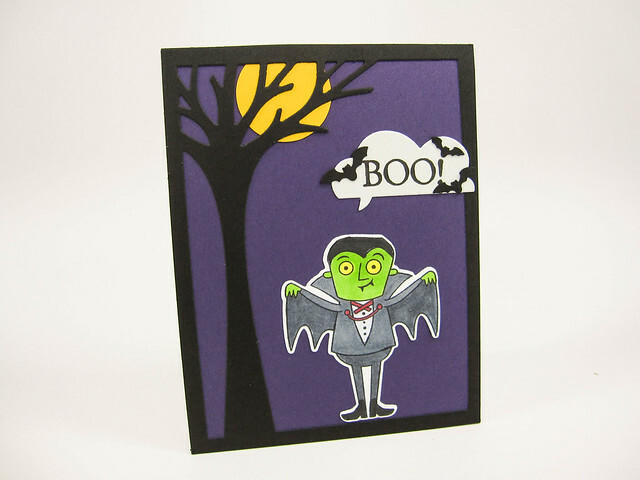 The cardstock was then die cut using SSS’s Full Card Sunshine craft die. I saved the die-cut pieces and the negative space for the final assembly of the card. Using another piece of watercolor cardstock and a cloud stencil, I colored the cardstock using a blending tool and Distress Oxide ink in Broken China to create clouds. After the cloud background was finished, I laid the negative die cut piece from step #2 over the background and used it as a guide to properly place the sun and the sun rays onto the cloud background. I glued down each piece with a glue pen and lifted off the negative guide piece after everything was glue into place. Next, the hello and summer dies were die-cut from turquoise cardstock. The puffy cloud was cut from vellum using one of the dies from a nesting clouds die set. The sun and sun rays were already adhered to the cloud background in step #4. This assembled piece was then cut down to around 1/8-inch on all sides. The die-cut “hello” and “summer” were glued to the vellum cloud using a glue pen. Sequins were adhered to the cloud using mini glue dots. Glue dots were adhered to the back of the vellum cloud behind the sequins and then the entire cloud piece was adhered to the card front. An A2-sized turquoise piece of cardstock was used as a mat. The mat and card front were adhered to an A2-sized, top folding, portrait-oriented card base. 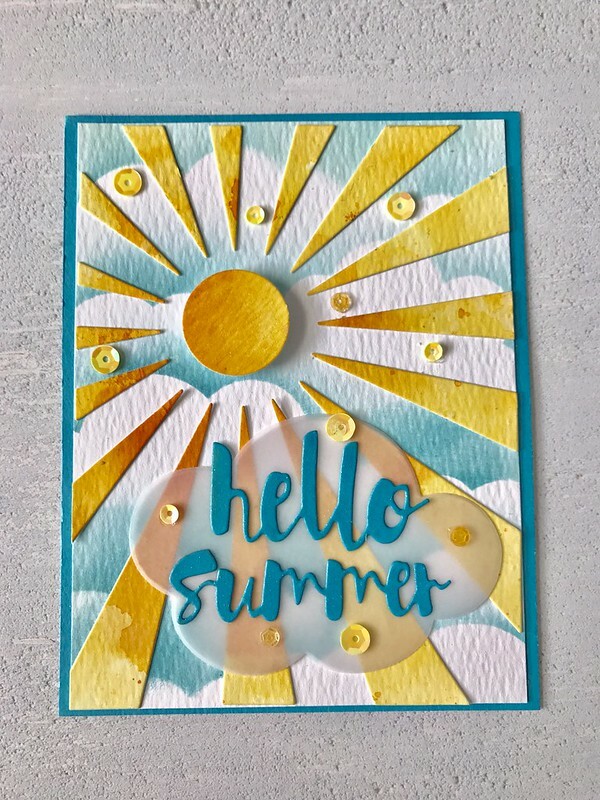 SSS: Full Card Sunshine craft die; Painted Hello wafer die; Painted Summer wafer die. Hero Arts: Nesting Clouds Infinity dies.